During the London Design Festival 2012, a new sound experience comes to Trafalgar Square, one of London's busiest tourist attractions. Amid the cacophony of the crowds, passing buses and the occasional bagpipe player, the BE OPEN Sound Portal is a black rubberised structure that offers those who enter a pure acoustic experience, with specially commissioned pieces by international sound artists. The installation was co-produced by the London Design Festival and the BE OPEN Foundation, a think tank that aims to promote global creativity and innovation, headed up by Russian businesswoman, entrepreneur and philanthropist Elena Baturina. Other sound artists and composers commissioned by Sound and Music to produce pieces for the BE OPEN Sound Portal include Norwegian artist Jana Winderen, whose work plays with the “audio topography” of oceans and ice crevasses, and Squarepusher, the pseudonym of UK-based drum and bass musician Tom Jenkinson. Renderings of BE OPEN Sound Portal at Trafalgar Square courtesy of Arup. All other photos by Charlene Lam for Inhabitat. 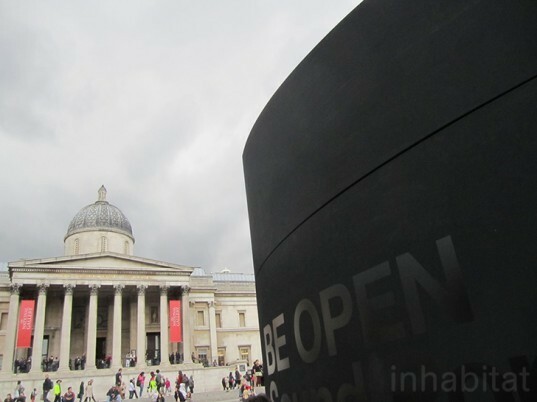 The BE OPEN Sound Portal is installed in London's Trafalgar Square, in front of the National Gallery. Trafalgar Square, in Central London, is one of the busiest locations in the city. The round black structure of the BE OPEN Sound Portal is entered via a short, curving passageway. The interior of the space is in stark contrast to the black exterior, with white walls and generous skylights. Through the speakers, visitors get a pure acoustic experience, with specially commissioned pieces by international sound artists. Through the skylight, part of Nelson's Column, the structure in the middle of Trafalgar's Square, is visible. The walls of the circular interior space are covered with mesh fabric. Visitors to the BE OPEN Sound Portal can sit on the round bench in the center to absorb the sounds of the specially commissioned music compositions. The installation was co-produced by the London Design Festival and the BE OPEN Foundation. 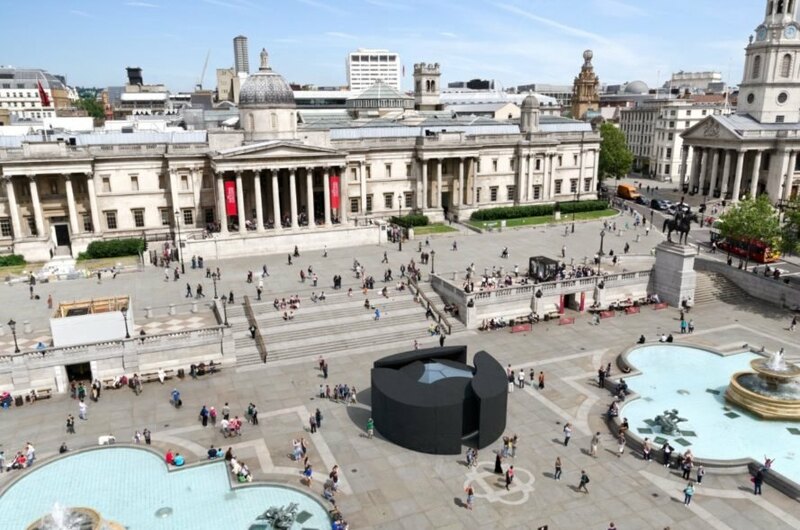 The site-specific installation will be in Trafalgar Square through September 23, for the duration of the London Design Festival.